This cat, though not common among us, has qualities which have made it live through many centuries of breeding in its country of origin: Japan. Learn a little more about it. His tail is short, but the folded shape makes it look even smaller. In some positions it may look similar to the powder puff, such as in rabbits' tails, formed by the way the fur grows in that area. All of this draws much attention, and it has become a trade mark, which explains its name: Bobtail. Another curious aspect is the fact that the back part of its body is taller, because the hindlegs are longer. This detail makes the Bobtail inflect slightly his hindlegs, in order to maintain the body leveled. It is, at the same time, thin and well-muscled, and its head is triangular. The color which was most difficult to settle genetically, and the favorite with the Japonese, is the tricolor, called mi-ke: white, decorated with black and white spots, well defined (they do not mix). There are other varieties, the tricolor, known as tortoiseshell in black, red and beige, and the bicolores black and white, and red and white. There are cats with one color coat, which can be black, red or white. Even though it is known by an English name, the Bobtail is really an ancient Japonese breed, believed to exist for about 2.000 years. 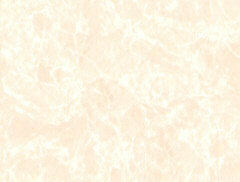 There are sketches of it in ancient ruins and documents, sitting next to gueishas. In the times of Gotokuju, in Tokio, the walls were decorated with paintings of one of theses cats, whose name was Maneki-Neko, which means "Welcoming Cat." They used to say it brought good luck. The fact that it was bred in the royal court, as well as by the richest families in Japan, is common knowledge. The Bobtail only arrived in the US in 1969, brought by the American breeder Judy Crawford, who had been breeding it in Japan since 1949. But its recognition by the CFA, Cat Fanciers Association, occurred only in 1978. In Europe, it was officialized as a breed in 1989 by FIFE, Federazione Internazionale Felina. There are breeders in China and Korea. In Brazil it is rather rare. 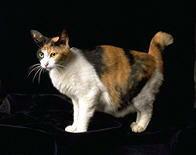 The Bobtail is affectionate and docile with his owners, and sociable with their friends. Veterinarian Andrei José Generoso Marqui, from Campo Limpo Paulista, in the state of São Paulo, and his sister Ana Larissa, got a mi-ke female cat Mika-Tibiko (Meaning Child of Three Colors, in Japonese) from a friend who lives in Tokyo; say she is affectionate. Marqui says that when Mika jumps on someone's lap or shoulders, she licks that person's chin, and rubs her head on it. "She is very affectionate, even with my friends. She demonstrates affection by rubbing her head on them, and when she jumps on her favorite, a Japonese friend of mine, she turns upside down, which is a sign of trust." Curiously, and contrary to many other cats, this one appreciates playing in the water. Tranquil and silent, it mews little. It also has the habit of taking objects to its owner. "Mika brings me everything she finds: small paper balls, her little toy mouse, and even takes everything she hunts to my door, as a gift," says Marqui. Standard: Medium sized, long and thin body, but well-muscled. Triangular head, long nose, large and oval eyes, matching the color of the coat, in which hair grows inclined, plus large ears, erect, with round tips. Oval feet, short tail, 10 to 13cm, in a curved shape, which makes it look half its size, with long hair. Long legs. The hindlegs longer than forelegs. Soft and silky coat, medium length. Special Care: Hair comes off, but less than in other breeds, demanding ocasional combing.